Ethan B. Katz. The Burdens of Brotherhood: Jews and Muslims from North Africa to France. Harvard University Press, 2018. Headlines from France suggest that Muslims have renewed an age-old struggle against Jews and that the two groups are once more inevitably at odds. But the past tells a different story. The Burdens of Brotherhood is a sweeping history of Jews and Muslims in France from World War I to the present. Here Ethan Katz introduces a richer and more complex world that offers fresh perspective for understanding the opportunities and challenges in France today. Focusing on the experiences of ordinary people, Katz shows how Jewish–Muslim relations were shaped by everyday encounters and by perceptions of deeply rooted collective similarities or differences. We meet Jews and Muslims advocating common and divergent political visions, enjoying common culinary and musical traditions, and interacting on more intimate terms as neighbors, friends, enemies, and even lovers and family members. 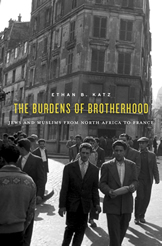 Drawing upon dozens of archives, newspapers, and interviews, Katz tackles controversial subjects like Muslim collaboration and resistance during World War II and the Holocaust, Jewish participation in French colonialism, the international impact of the Israeli–Arab conflict, and contemporary Muslim antisemitism in France. We see how Jews and Muslims, as ethno-religious minorities, understood and related to one another through their respective relationships to the French state and society. Through their eyes, we see colonial France as a multiethnic, multireligious society more open to public displays of difference than its postcolonial successor. This book thus dramatically reconceives the meaning and history not only of Jewish–Muslim relations but ultimately of modern France itself.